Why go to Tacoma when Seattle is the big-name city in Washington State? Well, Tacoma has a lot to offer, and in recent years has undergone a massive revitalization, which is still ongoing. Getting to Tacoma is easy from the Sea-Tac Airport, as it’s just an 18-mile (29 km) drive. You may want to rent a car to visit outlying areas, but if you plan on staying in the city center, a shuttle or taxi ride might be the way to go. By 2005, the waterfront area was revitalized and the city was chosen to host the Tall Ships 2005 festival. This festival, which travels to different coasts and different cities each year, is a boon to any port it visits, as thousands of tourists and residents come to view the gorgeous vessels. This was the first time Tacoma hosted, and the festival was a hit. Probably the most dramatic change in the last few years is the creation of the Museum District, where you’ll find the Museum of Glass, the Chihuly Bridge of Glass, the Tacoma Art Museum, the Washington State History Museum and Union Station. All of these institutions are within one to five blocks of each other, and near the waterfront. Around the Museum District are increasing numbers of hip boutiques, the ubiquitous coffee shops found everywhere in Washington, and trendy restaurants. The free Tacoma Link Light Rail, which runs a circuit of 1.6 miles (2.5 km), conveniently connects this area with the also re-burgeoning theater district. However, if you have on your walking shoes, it’s just as easy to get around on foot. A good base for exploring the downtown area is the Tacoma Courtyard by Marriott (1515 Commerce Street , 253-591-9100;www.marriott.com), which is located a couple of blocks from the Museum District, and is right on the Light Rail line. The new hotel has a small indoor pool, hot tub, gym, bar and lounge. It’s an excellent, comfortable spot for weekend travelers. For lunch, visit Grassi’s Garden Café (1702 Pacific Avenue, 253-627-7196; www.grassisflorist.com). The quirky café is located above a flower shop (look carefully for it; it’s easy to miss!). This delightful spot (just a quick walk from the Marriott) has salads, sandwiches and pasta dishes. They also have a box lunch, should you want something to go. Take the Light Rail and visit the Theater District, also undergoing revitalization. The Broadway Center for the Performing Arts (901 Broadway, 253-591-5890; www.broadwaycenter.org) encompasses three theatres ― the Pantages, Rialto and the Theatre on the Square. 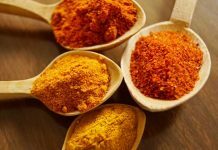 A visit to the website before you come to town might reveal something appealing from one of the theaters. An amusing thing to look out for: public benches that look like theater seats! Antique Row, adjacent to the Theatre District, is composed of two blocks of shops, which makes for fun exploring or window-shopping. For dinner, head down to the waterfront restaurant Blue Olive (1715 Dock Street, 253-383-7275; www.blueolive.net). This swanky eatery has awesome views, outdoor seating, an Asian-inspired menu and funky cocktails. After a surprisingly nice breakfast buffet at the hotel, take the “Dale Chihuly: A Walking Tour.” This tour, which runs Tuesdays through Saturdays between 10 a.m. and 2 p.m. (US$ 10), is a great introduction to the area and to Tacoma’s most famous native son. Call two weeks in advance for reservations. The American glass artist (born 1941), who is renowned worldwide, has donated an inestimable amount of his work to the city. 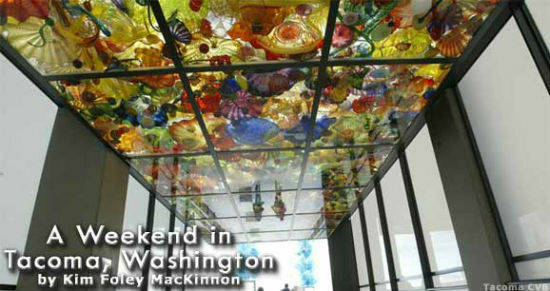 The two-hour tour, which starts at the Tacoma Art Museum (1701 Pacific Avenue, 253-272-4258;www.tacomaartmuseum.org), also visits Union Station and the Chihuly Bridge of Glass and includes admission to the art museum, so you can double back later to explore at your leisure. The Tacoma Art Museum, which boasts the largest retrospective of Chihuly’s work on permanent display, is the natural place for the tour to start. The museum opened in its new, bigger digs in 2003, doubling its size. While obviously Chihuly’s work is a highlight, the museum offers traveling and rotating permanent exhibitions. The small café at the museum, called “Untitled,” is a perfect place to rest your legs and grab a bite for lunch. If it’s a nice day you can eat outside on the patio. The menu changes weekly, but is always sure to please. At Union Station (1717 Pacific Avenue, 253-572-9310), you can’t miss Chihuly’s works, which hang in the rotunda, in the windows and in the upper gallery. The station, built in 1911 by the Northern Pacific Railroad, is on the National Register of Historic Places. If you feel like you’re in a mini-Grand Central Station, don’t be surprised. The same architects built both. No longer a train depot, part of the structure is home to the Federal Courthouse, which is why if you visit, your bag will be screened by security. For the last stop on the tour, you’ll head to the Chihuly Bridge of Glass, a 500-foot (152 m) pedestrian bridge holding US$ 12 million worth of Chihuly glass. The bridge connects the Museum of Glass (1801 Dock Street , 253-272-4258; www.museumofglass.org) to the Washington State History Museum’s plaza, across I-705. You may have already encountered the bridge if you went down to the waterfront, but no matter how many times you walk over it, you’ll never cease to be amazed by its beauty. The bridge is not actually made of glass, but you’ll find three stunning art installations on it: the Seaform Pavillion, the Crystal Towers and the Venetian Wall. For example, The Towers look like stacks of blue glass ice cubes. The Venetian Wall encloses the bridge on two sides, both of which display Chihuly’s art. And the glass ceiling, which displays hundreds of colorful, sea-inspired works, is called the Seafoam Pavillion. The time of day, the time of year, the weather ― these all contribute to the way the light is reflected on the glass and the way you see it. For dinner tonight, you may want to go to another local hotspot, 21 Commerce St. (21 Commerce Street, 253-272-6278; www.21martinis.com), also a quick walk from the hotel. Make sure to partake of the fresh seafood offered. 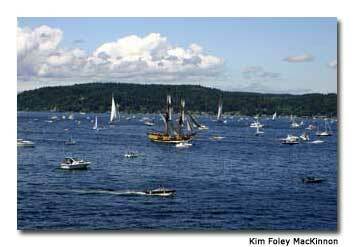 Lady Washington sails into Commencement Bay in Tacoma for the 2005 Tall Ships Festival. On your last day, the Museum of Glass (1801 Dock Street, 253.284-4750;www.museumofglass.org) and the Washington State History Museum (1911 Pacific Street, 253-272-WSHS;www.wshs.org) could fill your day. At the Museum of Glass, don’t miss the Hot Shop, where you can watch artists create their magic. The 180-seat amphitheater allows you to sit in comfort while a museum staffer describes the process of working with glass as it happens. The museum concentrates on contemporary works and is itself something to behold, with the Hot Shop (which is housed in a steel cone), plus outdoor works of art. The café at the museum offers sandwiches, soups and salads, which you can eat there or get as a boxed lunch to go. This is a good idea if you feel like heading down to the waterfront to eat and watch the boat traffic. The Washington State History Museum has the permanent “Hall of Washington State History” exhibit, which gives a wonderful overview of the people, places and events that shaped the state. It is also home to the largest collection of pioneer, Indian and Alaskan artifacts on the Pacific Coast. Rotating exhibits are world-class. For example, through October 2005, “Capture the Moment: The Pulitzer Prize Photographs” is on display. This exhibit has more than 100 of the winning photos from 1941 (the first year the award was given) to the present. The History Lab Learning Center for children at the museum has plenty to offer adults, too. For one thing, it has the state’s largest permanent model railroad exhibit. As an alternative itinerary, if you’re tired of indoor activities, head to Point Defiance Park (5400 N. Pearl Street, 253-305-1000; www.metroparkstacoma.org), one of the largest parks in the States (bring a picnic lunch with you, or eat at Anthony’s at Point Defiance, a seafood restaurant located at 5910 North Waterfront Drive, 253-752-9700 ). The park, which turned 100 this year, has Japanese gardens, walking trails, a scenic drive and much, much more. Inside the 702-acre (2.8 km²) park, there’s also Fort Nisqually, which is a restored Hudson Bay Company fur-trading post. Costumed interpreters give details on what life was like in 1885. The Point Defiance Zoo & Aquarium (253-591-5337; www.pdza.org) is also in the park, and a great destination for families. Before leaving Tacoma, have a casual dinner at the Harmon Brewery and Restaurant (1938 Pacific Avenue, 253-383-2739; www.harmonbrewing.com). With burgers, pizzas, salads and other pub staples, all done extremely well (try the quesadilla! ), you’ll go home with a full belly. Also, you can take home some of the delicious micro-brewed beer. Save it for a while and then in a few weeks, toast your memories of Tacoma from home!